Happy Sunday everyone! It's Victoria Day long weekend here in BC so it will be nice to have tomorrow off so Chase and I can spend some time together. If the weather is good, we may head to the beach for the day and hopefully get a shoot in! I don't have a lot of violet pieces in my wardrobe, so when I came across this light and airy top, I couldn't resist adding it to my summer top collection (it's currently on sale and less than $50!). And it just so happened to go perfectly with my new blue suede purse from Zara. To finish off the look, I added a gorgeous pair of pewter heels, metallic sunglasses, and dark distressed boyfriend jeans. An outfit like this would be perfect for a fun night out with your girlfriends! Hope everyone has an awesome week and thanks so much for stopping by and reading! Thank you! Really glad u like the look :-). It's definitely the perfect size bag for a night out too! Really nice casual outfit. I dig it. Love this look! You're so pretty! Such a beautiful look ! I really love your heels. Enjoy your day off today! Long weekends are the best. I love your violet top! Makes me think I don't have much of it either and need some. So pretty with that great bag. The perfect blue for this season! I'm obsessed! Loving all the colors together in this post! Great job, Ela!! I'm in love with those heels!! I knew that purse was from Zara! I totally saw it the other day! It's so cute! Perfect for a nice sunny day out! Love the outfit dear! Beautiful Ela! The accessories really make this outfit pop. 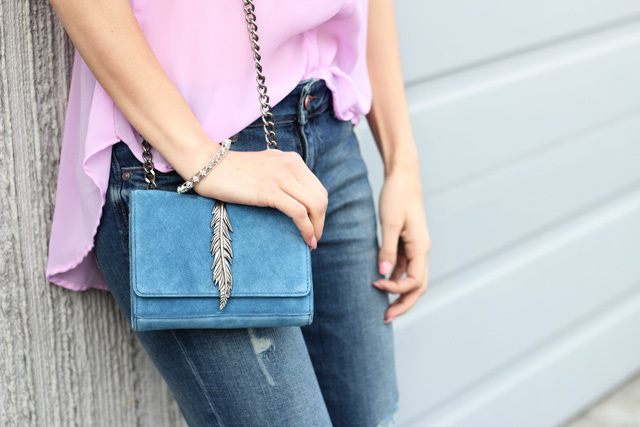 The crossbody and heels are a knock out combo! I hope you had a great day off! I adore tops like that! I honestly tend to grab one everytime I shop and then ask myself: "Hang out, you already have that in 3 similar shades" :) It's a beautiful top though, hon!! I am in absolute awe about your little bag & those sandals <3 Such a gorgeous look, my dear Ela. You're always a fashion inspiration for me. Love your chic weekend look! That purse is so gorgeous! I am obsessed with those heels!!!! 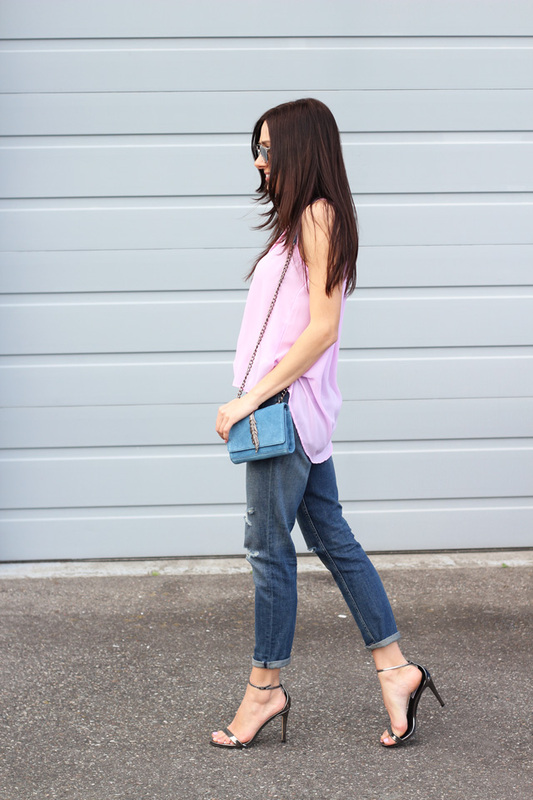 I love this bag and how you style it!